His father was a drunk who regularly beat him. His name was Josef Stalin. Born in Russiaâ€™s Georgia, in 1878, under the rule of the Romanov Czars, he excelled as a student, while building up a deep resentment towards the cruel occupiers of his Caucasus region. Stalin became a Marxist revolutionist and a master conspirator. 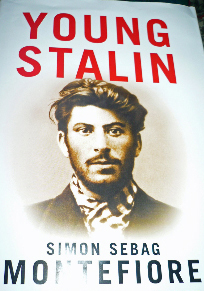 The book, â€œYoung Stalin,â€� by Simon Sebag Montefiore, tells how this merciless, but extremely talented, psychopath was forged. â€œTell Stalin I shall be dying with his name on my lips.â€� - Nikolai Ezhov, ex-boss of Russiaâ€™s feared secret police, the NKVD, prior to his execution on the orders of the dictator. The last book I read about a serial killer was called, â€œThe Iceman.â€� It was the tale of a New Jersey-based thug, one Richard Kuklinski, who murdered upwards of 100 people. Many of his victims were Mob-related targets. Kuklinski's brutal and alcoholic father used to beat him unmercifully. This was also Stalinâ€™s fate! His father, known as â€œCrazy Beso,â€� failed in his business--he once had ten employees--and became a miserable drunk. He took his wrath out on his only child. Eventually, he abandoned the family. Stalinâ€™s doting mother, known as â€œKeke,â€� was then forced to clean houses to put food on the table. Malicious reports that she was promiscuous remain unproven, as do the wild charges that someone other than Beso was Stalinâ€™s father. In fact, if you look at the photo of Beso in the book and compare it with the pictures of Stalin found there, when he was about his fatherâ€™s age, there are striking facial similarities. Beso was, indeed, Stalinâ€™s father! Stalin was â€œa natural born extremist.â€� Probably, the author suggests, because of his â€œsparser emotional attachmentsâ€� and the fact that he had â€œless to lose.â€� He also rarely showed â€œcompassion for people.â€� His paternal roots could be traced to a semi-pagan mountain people, the Ossetians, who lived in northern Georgia. His grandparents on both side were liberated serfs. At birth, Stalinâ€™s second and third toes of his left foot were webbed. At age six, he suffered from a bout of smallpox, which permanently scared his face with pockmarks. A few years later, he sustained serious injuries, as a result of road-related accidents, to his left arm. It caused that limb to be shorter than his other arm. It was around this period that Stalinâ€™s extraordinary, and shadowy life as a revolutionist began in earnest. The authorâ€™s ten years of meticulous research shows that it involved â€œbank robberies, [running] protection-rackets, extortion, arson, piracy, murder [and] political gangsterism.â€� Stalin became Leninâ€™s go-to guy for illegally funding the Bolshevik Party. Along the way, right up until 1917, Stalin was also developing skills as a political and labor organizer, prison escape artist, propagandist, newspaper editor, adept intriguer and as a thoughtful political theoretician. 1. â€œTen Days That Shook the Worldâ€� by John Reed. 3. â€œA Hangingâ€� is a powerful essay by George Orwell, and one of his very best. It was written under his real name, Eric A. Blair. Â©2007, William Hughes, All Rights Reserved. William Hughes is a video and print journalist. His videos can be found at: http://www.youtube.com/profile?user=liamh2.